A lot has changed for my son and I since we attended our first National Hockey Card Day back in 2013. We started our own father/son YouTube channel (Young Guns Breaks) where we open boxes of our favourite product and talk about collecting for kids. Our collecting habits have also changed from solely attempting to complete sets to starting personal collections and chasing larger hits. 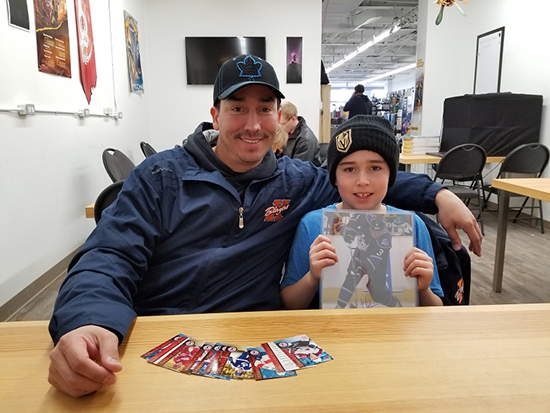 That said, the initial spark was that first National Hockey Card Day together, when I saw the excitement in my son’s eyes as he opened his free Upper Deck NHL® packs on that special day. 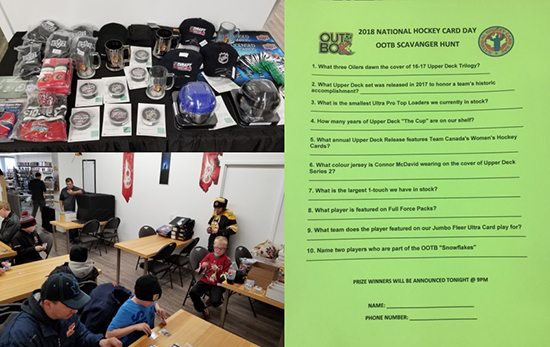 We spent this year’s National Hockey Card Day at Out of the Box Cards where there were a ton of great events going on such as a scavenger hunt, giveaways and pack wars! We were even fortunate enough to score a signed Jari Kurri 8×10 in one of the giveaways! 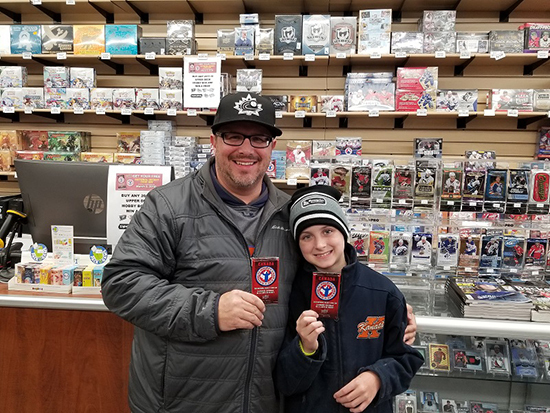 Spending time with my son on National Hockey Card Day is very special where we make some incredible memories! It was fun, and familiar, to watch the way parents and kids interacted in the store. The kids excitedly looking at the different packs while the parents stood back, acting cool as if they didn’t want to rip open a few packs themselves. Each time a negotiation process would take place as the kids tried to gauge just how many cards they could get out of the store with. We spoke to a few of the families to find out why they love collecting together and there were some really great answers. Out of the Box Cards does a great job of engaging fans year round! 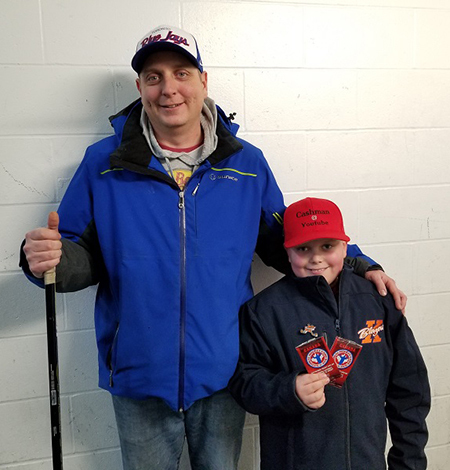 Ethan and Owen had differing views on what they love most about hockey cards, with Ethan stating that he loves the big hits, while Owen really just loves the excitement of opening the packs. My son agreed with Owen in that there’s something special about ripping into that pack. Neither one of the boys were particularly interested in completing sets anymore, opting instead for working on their personal collections of Pekka Rinne and Jonathan Drouin cards, but they both agreed that Upper Deck Series 1 is their favourite product to open. While dad mentioned that he doesn’t personally collect anymore, he did say that he is slowly passing his collection on to his kids and enjoys talking about his older cards with them. Next up we ran into the father son duo of Dan and Aiden! Once again it was the excitement opening new packs that Aiden loved most about hockey cards. While he loves adding to his personal collection of Mitch Marner cards, he is also a fan of completing full sets of cards, especially his favourite set of the year; the Toronto Maple Leafs Centennial collection. His father, Dan, remembers collecting baseball cards as a kid and points out that everything is so different nowadays in that you can pull sticks, jerseys, autographs and all sorts of exciting inserts that weren’t available previously. 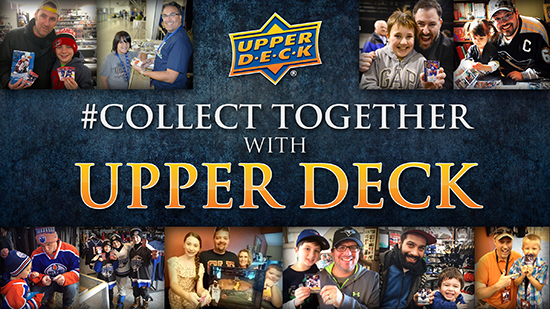 Much like our story, Dan mentioned that they started by buying packs of Upper Deck MVP hockey a couple years ago but their passion for collecting has grown over the years and now they collect multiple sets a year. Dan and Aiden love breaking open Upper Deck NHL packs! Rene and Jayden are just getting started on their collecting journey and you can tell by Jayden’s smile that he’s already hooked. He is a big fan of both Connor McDavid and the Upper Deck MVP Hockey cards. While Jayden’s dad, Rene, admitted that he loves watching his son’s excitement as he opens his packs, he does miss the stick of gum that used to come with the cards. I directed him to eBay where there is sure to be packs with 20-year-old sticks of gum to enjoy! 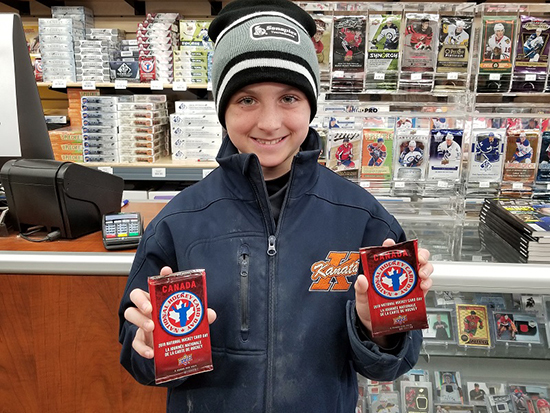 You can see Jayden’s enthusiasm as he gets ready to crack open a National Hockey Card Day pack! Cash is a player on my son’s hockey team and it was really cool to see his excitement when he opened his free National Hockey Card Day pack to reveal a Connor McDavid card. It was fun seeing go from teammate to teammate excitedly showing off his newest collecting addition. In talking to his dad, Scott, about how different collecting is today from when we were kids, he remembered how him and his friends used to stick the cards in their bicycle spokes so everyone would hear them coming. We couldn’t even imagine our kids stuffing a Connor McDavid Upper Deck NHL® Young Guns card into their spokes today; especially consider it’s worth way more than the bicycle! 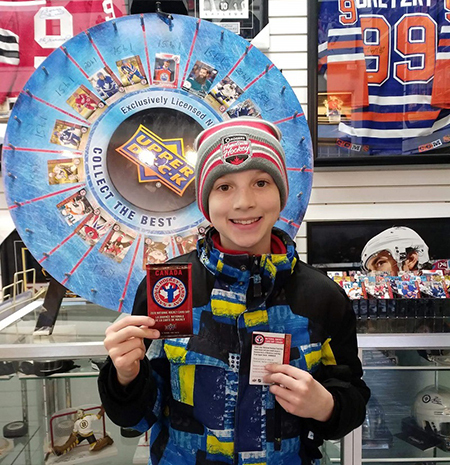 Upper Deck NHL cards bring smiles to almost every kid’s face! I could tell that the final family I spoke to on National Hockey Card Day were no amateurs to the collecting game. Kids Rocky and Olivia, and parents Amy and Steph stopped by to take in all the festivities of the day, but especially trader’s night. The thing I thought was the coolest about this family is that everyone played a role in maintaining the family collection. Olivia, however, no doubt had the biggest task of sorting all the cards and making sure they were in the right order. Rocky talked about his love for chasing big hits and his personal collection of Max Domi and various Pittsburgh Penguins cards. The kids joked about how many Ryan Spooner cards their mom, Amy, had in her personal collection. 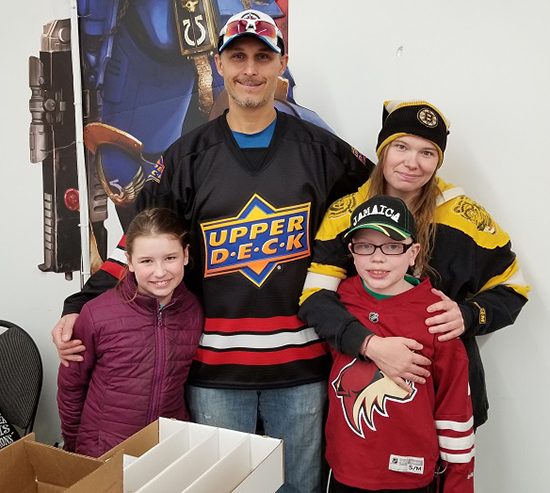 It was really fun talking about their family trips to the Sports Card Expo and it was obvious that collecting is something, as dad Steph put it, is definitely a family affair for them. Collecting as a team is something that brings this family closer together. We visit Out of the Box Cards a fair amount but National Hockey Card Day has to be one of my favourite collecting days of the year because you get to see so many families sharing their love of cards together. I’m definitely interested in hearing from more of you about what you love most about collecting with your kids, so please feel free to leave a comment with any fun stories you may have. Now if you’ll excuse me, we still need to find three more cards to finish our 2018 Upper Deck National Hockey Card Day set! If you missed National Hockey Card Day, don’t wait till the next one. Get out with your kids and visit some shops or his some card shows. My son and I have made some great memories together since we started. What are you waiting for? Collect together! Chris Read is the voice behind Canadian Dad and the Creative Minds Podcast. He is a father, husband, writer and advocate for dads everywhere. Chris is also the founder of the Gil Read Memorial Foundation, whose mission is to help less fortunate children compete in organized sports. Nice story. Collecting is fun. I have been working on my OPC 1971-72 set for a few years. Down to three cards to complete.